Rifiuti in cerca d'autore ["Garbage in search of an author"] is a pun on the title of the play by Luigi Pirandello, Sei personaggi in cerca d'autore, but for our purposes it's the name of an International Competition for Art & Design (2nd edition) sponsored by the organization Salerno in Arte. The competition seeks to stimulate imaginative and creative approaches to dealing with the never-ending crisis of garbage, rubbish, trash, waste or whatever you call it where you live. The competition runs through mid-October, at which time 40 finalists will be selected by Ecomondo in Rimini (nowhere near Salerno!). If you need help, the photo that accompanies this item is by Andrea Petrone and was part of the preview of the first competition last year. 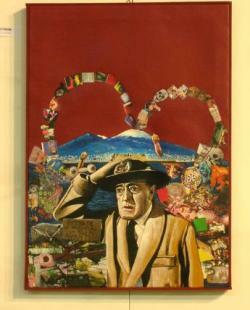 It shows famous Neapolitan comic, Totò being bombarded by trash erupting from Mt. Vesuvius. Gallery Napoli nobilissima is one of the many art galleries in Naples that sort of doubles as a museum/exhibition hall. The gallery takes its name from a cultural journal founded by Benedetto Croce and was founded in 1969 in the heart of the historic center and moved to its current premises at Piazza Vittoria in 1985. It underwent extensive renovation in February 2009. Currently on display and running through the end of September is an exhibit entitled Oltre il mare [Beyond the Sea], divided into four sections: The Wonders of the Sea, The Sea that Watches, The Myths of the Sea and Man and the Sea. The works cover centuries of art, from Baroque masters such as Luca Giordano, Paolo de Matteis and Salvator Rosa to the present. The Cerio museum on Capri is running a display through September that covers "everything"! They're not kidding: Greek and Roman archaeological sites, geology of the island, paleontology (featuring coral fossils and mammoth elephant bones), pre- and protohistory (early human artifacts), and unique zoology (the blue lizards of the Faraglioni, rare sea shells, etc.) The say the guided tour lasts only 30 minutes. I don't understand that. Best to call ahead: 081.8376681. Volkswagen is here. Whoopee. The German car manufacturer is sending its "Polo Dance Tour" around various metropolitan centers in Italy in order to advertise the new VW Polo. Somehow, people in the Campania region were afraid they were going to be snubbed and left out in the bitter No-Polo-Dance-Tour wilderness, but, hallelujah, even as we speak, the dancers—young & enthusiastic cheerleading types—are springing out of the wood-work in large commercial shopping centers in Campania and dancing their little hearts out for ol' VW. It's enough to make me buy a Fiat. Seems to me I've heard this song before... but the Coroglio road is now definitively and once and for all open again for alternating one-way traffic until it closes the next time. The road is the only convenient way from Posillipo to Bagnoli and back. "Alternating one-way traffic" doesn't mean that you are forced to drive back and forth up and down the hill forever like some doomed Flying Dutchman (at least I don't think it means that). They have these traffic lights that let the downers go down and then the uppers go up. 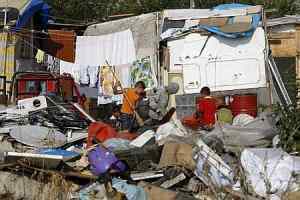 New quarters for 600 Rom —gypsies— will be built in the Scampia and Soccavo sections of Naples. That will cover about 80% of the gypsy nomad population in and around Naples. The new quarters will cost around 35 million euros and will look more or less like other "popular" blocks of flats in those two areas. "Popular" doesn't mean that people like them; it means that they can be built quickly and stuffed with people. The main impetus for the project is the need to get rid of the squalid gypsy encampments. There are no colorful horse-drawn wagons or gypsy violinists playing Monti's Czardas; there is a lot of open sewage, though. Capri. Four Neapolitan tourists from ages 17 to 41 have been caught taking a forbidden swim in the cool waters of the Blue Grotto. That's right—inside. They got in there at a time when high tides forced the suspension of the normal tourist traps boats. My heart goes out to them because I tried that once with some other scuba divers and we never even got close before we were spotted and warned off. These four dropped a rubber raft into the water from a larger motor launch and went in for a dip. They have been banned from the island for three years and face some generically bogus charges of creating a maritime hazard. More on Capri. The summer is winding down, and that’s fine because it has been a disastrous summer for the Blue Grotto, one of the island’s greatest tourist attractions. First, in mid-August, they caught a local businessman dropping hundreds of glass bottles in the water near the entrance. Well, glass sinks, you say—maybe that’s not so bad. (You’re wrong, of course.) Then, a few days ago, two owners of a local restaurant were caught fouling the waters with raw sewage. They just dumped it in. Now, the Blue Grotto has been closed until they can figure out what has caused the gigantic film of white foam in front of the entrance; the foul, burning odor was enough to send four boat operators to the hospital. Chemical analysis says that it is a combination of chlorine and bleach. Likely culprits are leaks from sewage lines or nearby swimming pools.